Nashville, Tennessee has taken the initiative to mitigate urban flooding due to rainfall through the use of green infrastructure. The city took a low impact approach by implementing measures that would capture water before it entered the combined sewer system, thus relieving pressure on an over-taxed system. The cooperation of several actors and agencies was instrumental to the success of this flood mitigation approach, including municipal water services, design firms, an engineering firm, and a non-profit organization dedicated to low impact development technology. Deaderick Street, Nashville, TN. Photo via Clean Water Nashville. The Nashville Green Infrastructure describes a successful green infrastructure program as one that “involves physical and institutional components and support systems.” The project team asserts that green infrastructure in Nashville is not only about designing and building, it also necessitates institutional support. An ordinance was amended in the city’s code to establish a stormwater planning district that coincides with the area of the city’s combined sewer system (CSS). The ordinance directed Metro Water Services along with the Planning Department, The Development and Housing Agency, and the Department of Public Works, to develop a plan to install green infrastructure within the stormwater master planning district. The ordinance also instructed the plan developers to contain a list of infrastructure projects with maintenance costs and estimated impact on the CSS to be included in the following year’s capital improvement plan. The projects set forth in the plan include retrofits for existing developments as well designs for future developments such as bioretention ponds, permeable pavement, tree box filters, and vegetated roofs and swales. The Green Infrastructure Master Plan was developed in three stages. First, a technical analysis was performed. This involved collecting data and analyzing different scenarios to determine which projects would be best suited for use with the CSS, including the potential impacts they could have on inflow to the CSS. This technical analysis was important in selecting sites and projects that would have a significant impact on the CSS, which would be pursued further. The second stage concerned incentives and financing. This involved documenting communities that effectively implemented Green Infrastructure programs by using incentives to encourage their use. The third and final stage in developing the Master Plan concerned project selection and design. This involved identifying twenty projects for possible implementation, and then pushing five further by developing conceptual designs. See sections 2-5 of the Master Plan for details of the study results. Six projects were focused upon for implementation. The main goal of these projects is to intercept stormwater before it enters the CSS and before stormwater causes flooding in the area. Different Green Infrastructure measures were proposed for each site. Analysis was used to estimate the reduction in stormwater runoff volume and the construction cost for each of the six sites. The city of Nashville and Davidson County have a propensity for flooding during rainfall. The city uses a combined sewer system, which overflows when inundated with high volumes of stormwater. 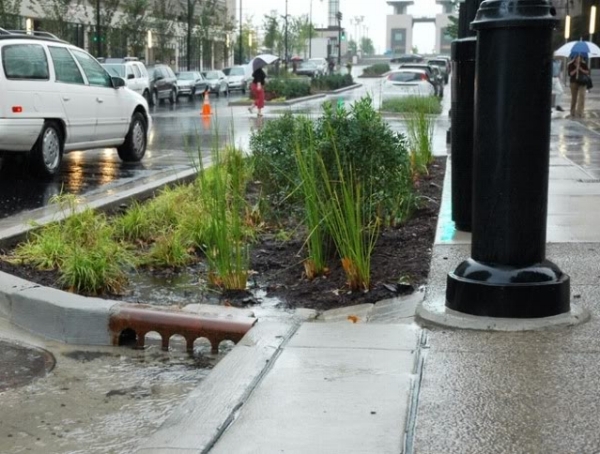 The Green Infrastructure Master Plan was created to address stormwater management. A Stormwater Master Planning District was created that coincides with the service area of the combined sewer system. This provided planners with an area to focus on for relieving stormwater pressure. The project team used GIS and LiDAR mapping data to analyze the coverage of flat roofs that could be retrofitted with a green roof. They also mapped the existing tree canopy. Increasing urban tree canopy was viewed as an important component of the Green Infrastructure program. In-depth analysis of stormwater management designs allowed the project team to estimate the anticipated reduction in stormwater runoff volume and construction cost for each of the project sites. The project team addressed the community through outreach and education. Additionally, the team supplied developers with supporting documents that demonstrate the potential effectiveness of green infrastructure on their sites. Nashville and Davidson County offered incentives for implementation of green infrastructure, which were successful in motivating residents and businesses to make changes to their property to improve stormwater management. The plan contains summaries of many incentive programs in other American cities, to investigate which incentives were effective in other cases. The Plan contains summaries of many other projects in cities across the country. It is a good reference for the resiliency community. Five incentives for implementing green infrastructure were developed including: stormwater fee discounts, rebates and installation financing, development incentives, grants, and awards and recognition programs. The combined sewer system conveys both stormwater and sewage. This plan focused on the area of the CSS as an area to implement green infrastructure designs. The approach of the Nashville Plan is to align green infrastructure with the drainage basins that connect to the combined sewer system. Combined sewer systems often overflow when heavy rains fall. Designing to keep rainwater out of the sewer system can prevent the system from being overtaxed. Six projects were highlighted for green infrastructure implementation. The Plan contains a wealth of information about green infrastructure. The Nashville and Davidson County project team recognized there are essentially four components to a green infrastructure program: planning, development, construction, and maintenance. They asserted that for an effective program, policies and institutional components must be put in place. Nashville and Davidson County incentivized green infrastructure during the planning phases, as a way to integrate it into parks and streets planning. They also provided support documents and educated developers and the public to encourage the use of green infrastructure. This motivated developers and the public to implement these strategies. With regard to funding, the Plan notes that securing revenue is the immediate challenge for municipalities. The Plan states that there are generally three categories of funding sources for green infrastructure: stormwater fees, loan programs, and grants. The first two sources are relevant for funding large investments while grants are usually applied to small projects. Overall, the project team learned that taking small and slow steps to build the overall program was effective and that encouraging green infrastructure practices without having a comprehensive program is possible. Starting to build projects on a small scale allows others to see how they work, which builds momentum for creating a comprehensive program. Also, the City can construct demonstration projects and advertise them to encourage investment from private sources. Additionally, the project team recommends being flexible and adaptive in the program by monitoring public Green Infrastructure projects after construction, reviewing policies and regulations, and changing design criteria as new and improved information becomes available. Other suggestions include looking for grant opportunities, partnering with new development, beginning with individual green infrastructure practice programs to understand their successes to provide incentives for more integrated practices in the future, and educating citizens and stakeholders.